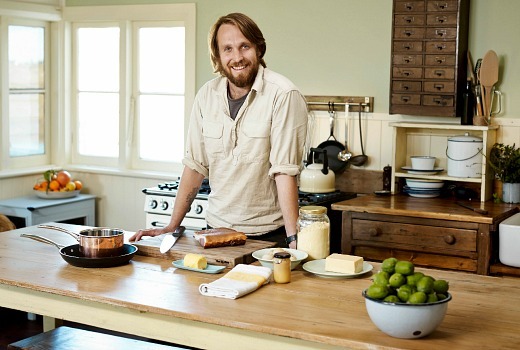 Renewed: River Cottage Australia -for 2 seasons. Foxtel has commissioned not one but two seasons of River Cottage Australia, which concluded its debut season on LifeStyle Channel last night. Hugh Fearnley-Whittingstall returned to Tilba, NSW, last night to see what local host former Tasmanian chef, Paul West (pictured) had been able to achieve living off local sustenance. What he has been able to achieve is getting the series to rank as the number one non-sports program across the STV platform while it was airing, and delivering the second largest consolidated audience for The LifeStyle Channel in 2013. General Manager of The LifeStyle Channels and Foxtel’s Head of Production, Duane Hatherly, said: “River Cottage Australia has been more than just a programme for so many of us involved in its development and production to date. From finding incredible talent in Paul West to turning the land and settling in at the property at Tilba – the stars have truly aligned. Paul West, aded “After going on an incredible journey filming the first season, I am humbled to be able to continue my role for a second and third season. I feel like I have only just scratched the surface of the farm’s potential and met only a fraction of the passionate people whole share a similar path. The series will be produced by KEO Australia with production to start later this year in Central Tilba on the NSW Sapphire coast. KEO have announced they are setting up in Australia off the back of this commission. ITV have been in search of a CEO since LL quit so I can understand why these dots are being joined. What is going on at ITV if David Mott is out of the running? Losing River Cottage will hurt. Leonie Lowe remains with ITV Aus until Sept. I don’t see any evidence of Foxtel play favourites, given they have productions with many companies. Ok this sounds wayyy out but please stick with me here. What if leonie lowe ex itv was the founding boss of keo australia and she actially got the nod to produce two seasons of River cottage??? Makes sense and what a wonderful start to your new ptoduction company?! Other places would kill for this sort of certainty. Not one season but two! Does Foxtel play favourites??? Let’s hope it pops up on FTA once Fox have finished with it. Great news. Paul West is totally perfect. It would be great to know how they found him. David, do you have any more information on KEO Australia? Is it a new company?